Glenugie in 1886. Held: Murray Henderson Collection, Glenside Progressive Assn. Inc. Location: Waitakaro, Corner of Glenside and Stebbings Road, Glenside. Glenugie has historic links with the naming of Glenside. The five bedroomed homestead was built in 1886 and lived in by the May family. The May family are prominent in the early Wellington fishing industry and have featured in a display at the Wellington Museum of City and Sea. The homestead was demolished about 20 years ago. A gravesite is located across the stream from the house site. In 1842 Bishop Selwyn camped near here, with an entourage of 28 Maori on his first visit to Wellington and blessed the gravesite. F Johnson, believed to be Frank Johnson, a miller and founder of Johnsonville. The Branks family. 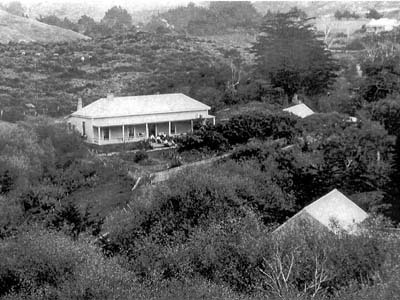 Mrs Branks was Wellington Public Hospital’s first admission in 1847. She died of her injuries. The Branks children and their father were murdered in the vicinity in 1849. The family is buried at St John Anglican Church in Johnsonville. The Wall family of Porirua, who opened their home to accommodate travelers and became known as operators of The Halfway House. The Wellington City Council advise that the current owner proposes to develop the house site and garden as townhouses.